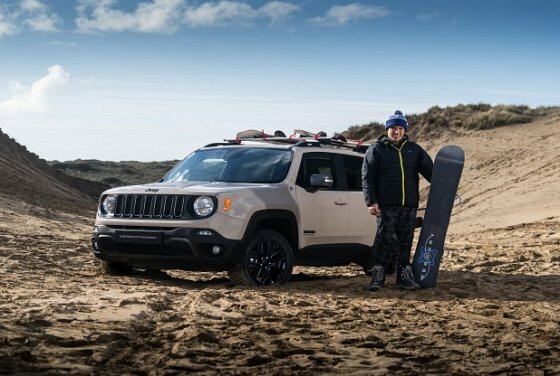 JEEP has unveiled its latest limited edition Renegade model by towing one of the country's best sandboarders in a series of epic stunts and tricks on Braunton Burrows in North Devon. Sandboarder Alex Bird helped mark today's launch of 100 Desert Hawks by becoming the first participant in his sport to be towed by a car on UK shores. Despite extreme conditions the Renegade helped Bird reach speeds of 40mph and negotiate a number of grinding rails, jumps and 90ft high sand banks. "I've never done anything like that before," said 34-year-old Bird. "It took time to get used to being towed at such speeds but I do a lot of wakeboarding and it was principally very similar. "The car performed incredibly well on such deep sand; if it wasn't so good off-road there's no way I could have got up to 40mph and nailed the jumps and stunts." The new Desert Hawk takes the Renegade Trailhawk's rugged appearance a step further with some exclusive features and functionality inspired by the desert. Available in Alpine White, Anvil, Black or – exclusive to Desert Hawk – Mojave Sand, the Jeep Renegade Desert Hawk features 17-inch Low Gloss Black wheels, exclusive bonnet and rear body panel decals. Thank you to Devon Life for the story.